Our chef Fay has been in Spain recently and has been making plenty of Gazpacho to cool and hydrate on hot summer days. Gazpacho is full of fibre, as well as essential vitamins and minerals, including iron, phosphorus, calcium, potassium, magnesium, sodium, manganese, zinc and copper. The tomatoes contain lots of vitamin E and you even get a vitamin C boost from the peppers. So not only is it delicious, it’s healthy, too! Below is Fay’s recipe for this Spanish favourite. All measurements are approx and can be adjusted to taste. – ¾ of a small cucumber if available, other wise use ⅓ – ½ of a normal cucumber. I sometimes substitute courgette – this gives a creamier Gazpacho. – 50ml vinegre de jerez if available, if not most vinegars will do, but not malt. – Blend well. Add water if needed. 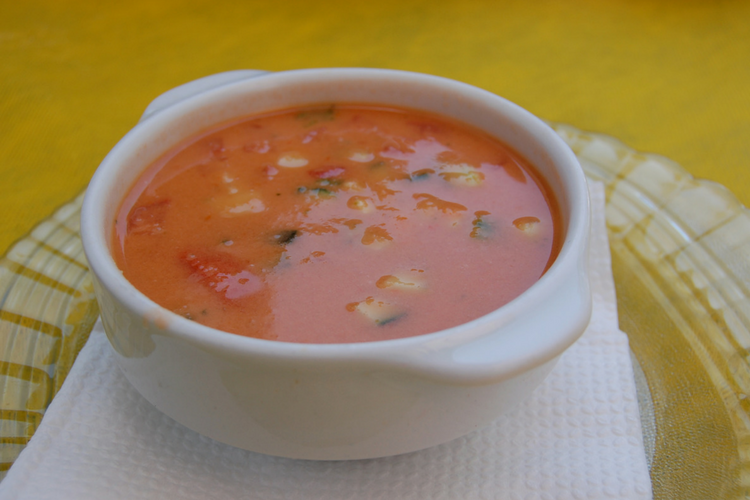 – Optional – make a drizzle consisting of sweet paprika, olive oil and salt to accompany your Gazpacho. Not only is Gazpacho popular in Spain, it’s also loved in Mediterranean countries too! We love eating this delicious cold soup on our summer holidays to Santorini. Click here to find out more!